Let me start by getting this off my chest. 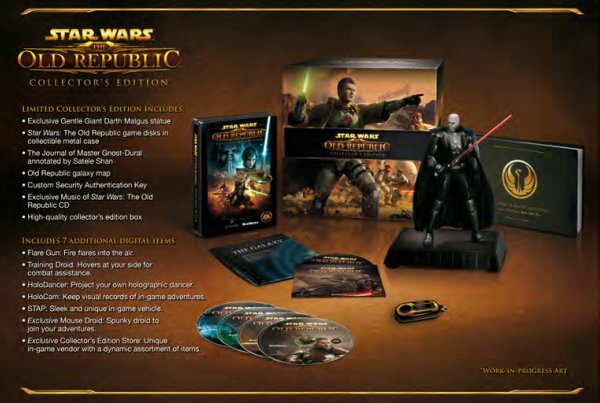 I am still so mad that I bought the $150 collector’s edition of SWTOR. I have never purchased a boxed collector’s edition of a game before that. I have only purchased a digital collector’s edition of a game once that I can remember (Rift) because I thought it was a good value. There was only one reason that I bought the collector’s edition of SWTOR and that is the special in game vendor that only CE purchasers have access to. If they had just allowed that bonus to be in the digital collectors edition (since, I don’t know, the reward is DIGITAL!!!) I could have saved a lot of money. But of course they knew that and they knew that the vagueness of what was purchasable on that vendor would have fans constantly second guessing themselves whether or not they should pony up and take a chance. The items currently available on this vendor can be summed up a “lame” to put it mildly. I would log in and verify it but I am currently no longer subscribed. I am also mad that I forgot to mention to them how crappy this vendor was when I filled out the survey upon cancelling my account. I mean, think about it – some games only charge like $49 more to have a lifetime subscription (LotRO and TSW come to mind). Previously, collectors editions had been coming in at the $80-$90 mark but for whatever reason BioWare (or more likely, EA) thought the hype machine was cranked up enough to charge almost double that and I fell for it hook, line, and sinker. Am I the only one who finds this trend disturbing? Do any of you feel regret about collector’s editions out there or am I alone in my misery?